Skat Foundation develops and implements tailor-made online or face-to-face training courses in all its areas of expertise. These training courses include a wide range of innovative methods for knowledge sharing and learning and are adapted to different types of organisations and cultural settings. Developing and running the course was made possible with financial support from UNICEF Programme Division, Skat Foundation and UNICEF Zambia. The course was carried out on behalf of the Ministry of Water Development, Sanitation and Environmental Protection Zambia. Please find the report as well as the links to the course material (Unit 1, Unit 2 and Unit 3). The previous collaboration between UNICEF, Skat Foundation and WaterAid culminated in the publication of a Guidance Note on Professional Water Well Drilling in 2016. The publication consolidates over a decade of experiences and publications into an easy-to-use manual for UNICEF staff and partners. 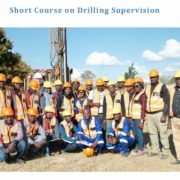 technical assistance to strengthen initiatives that develop capacity for professional drilling in Angola, Burkina Faso and Zambia and remote support for up to 15 countries in Africa to implement recommendations of the UNICEF Guidance Note on Professional Water Well Drilling. 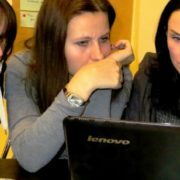 The online course report for participants as well as the material of the online course after registration at the Cap-Net virtual campus. UNICEF Toolkit: Borehole Drilling – Planning, Contracting & Management: A UNICEF Toolkit has been developed to bring uniformity to practices and to guide UNICEF staff involved in borehole procurement and the supply of equipment, as well as contracting consultancy services for borehole siting and supervision. Skat acts as technical, financial and managerial support agency to AfricaAHEAD in Zimbabwe and reports back to the donor of this project. It provides technical and managerial advice and enables international networking and information exchange with other organizations. Skat brings its know-how on accelerating self-supply, technical aspects, management and networking to the project. It acts as a sounding board to SHIPO to discuss and develop new ideas on how to improve quality, efficiency and profitability of the entrepreneurs, and how to professionalize the sector of manual drilling and pump production. Skat helped SHIPO to obtain funding from third parties and is providing its holistic support services. Skat also functions as the linkage between the donor agencies and the implementer, making sure that the experiences and lessons learned are communicated. Whereas the initial phases focuses on the technical and training aspects, over time the market and financing aspects became more and more important. Recently, Skat and SHIPO focused on improving their monitoring systems in order to document the progress achieved so far. Since 2012, Skat helped SHIPO to train more than 80 drillers, more than 80 welders (constructing pumps), benefitting more than 13’000 people. Since, the beginning of 2009 Skat offers a course on Network Management using as conceptual framework the GTZ handbook “Work the Net”. The course is offered both online and as a training workshop. Rationale, why offering a network management course? Knowledge networks are starting to have a significant importance in the development cooperation because they contribute to the vision of sustainable development by connecting sectors, organizations and professionals leading to more coordination, coherence, and innovation and by building a stronger knowledge base between organizations and experts. There are different aspects necessary to successfully manage formal networks such as: how to plan activities in complex systems like networks; how to find a balance between organisations working together (networking) and still keeping their independence; and how to establish an effective communication mechanism that will allow a disperse range of organisations to share information and knowledge. Network facilitators especially from developing countries have the need to strengthen their capacities, skills and knowledge for “network management”: setting up governance structure of networks, communication strategy of networks, strategic planning, funding and the use of knowledge management techniques. Skat designed and delivered an international train the trainers programme to a group of WaterAid staff. Using a wide variety of methods and “learning by doing” techniques, the training programme included online sessions as well as a three-day workshop at the headquarters of WaterAid. Since 2012, Skat Foundation has been developing training modules and providing training of trainers for high quality design and construction. 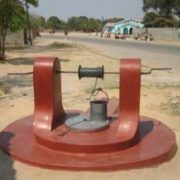 Although appropriate design and the quality of construction determine to a great extent the sustainability of water supply schemes, these aspects receive too little attention by most actors. 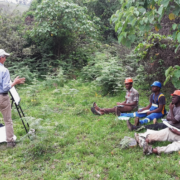 The practical approach and content of the training modules are developed and fine-tuned through pilot training courses that are implemented in Cameroon. However, the modular training concept containing about thirty modules will contain generic training materials which are valid for any location. 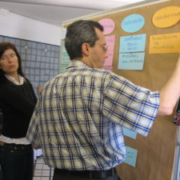 Five training modules addressing construction quality have already been completed in 2013. 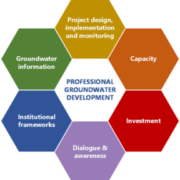 Based on needs assessments pilot trainings for the modules, “Spring Catchment Construction” and “Caretaker” were implemented in 2014. Accordingly the respective training modules were developed. The trainees for spring catchment construction applied the theory they were provided in the class room to the practical implementation of catchment construction, including tracing and quality assessment of springs, introduction of protection zones, excavation of springs as well as design and construction according to existing situations. 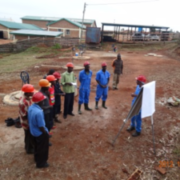 The caretaker trainees were instructed on the maintenance requirements through the systematic assessment of an existing water supply scheme starting from the protections zone, catchment, storage tank, supply mains and distribution system to the public stand pipes and private connections. Besides training on practical operation and maintenance implementation, guidelines and checklists were developed together with job descriptions. The modular training concept proved to be very practical and relevant (e.g. those trainees that had in advance undergone the modules addressing construction quality were best equipped for training on catchment construction). A guide for trainers and a manual for trainees are also part of this package.